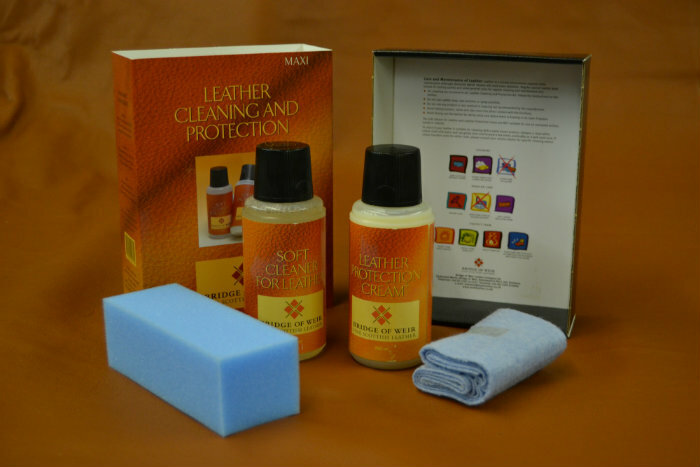 Leather cleaning and protection kit as recommended by Bridge of Weir Leather Company. Leather Cleaning and Protection Kit. This kit contains products for regular care and treatment of Aniline and Pigmented leather (not suede or nubuck). It contains Soft Cleaner, Protection Cream with an application sponge, cloth and instructions with examples of problem solving. Leather Protection Cream increases the durability, resistance against; stains, spots and spillages and provides the nutrition necessary to keep the leather soft and supple. Recommended application 2-4 times a year. It is also advisable to treat before use. Soft Cleaner is an efficient but gentle cleaner suitable for all category Aniline and Pigmented leather types. Recommended application 6-12 times a year (It is not suitable for nubuck and suede leathers).